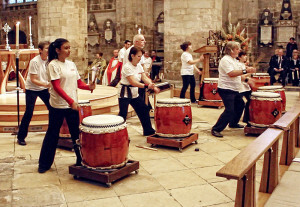 CCS Taiko played at Gloucester Cathedral on Sunday 11th October 2015 for the Mayor’s Civic Service and what an honour it was to play at such a prestigious event. We played ‘Mystique’ by Peter Hewitt and ‘Zoku’ by Kodo, both of which were thoroughly enjoyed by the congregation. It was commented that it was both most unusual and unique but equally highly entertaining and uplifting.